It’s no easy feat to be the Elfin Queen of the Forest. You see, forests are filled with trees, which hold such ancient magic it takes someone with a deep understanding of their ways to consult with them. She must not govern or instruct for trees cannot be controlled; instead, she must listen, collaborate, and love. The forest is an ecosystem, a community. Roots speak to each other over miles through a network of fungal mycelium. Canopies over head shield tender undergrowth and mark out their territories in precise lines and edges. Fallen logs break down into soft soil to nourish new generations of life. A single small acorn waits with an air of excitement, for it holds all of the genetic information to grow into a towering oak tree in such fertile conditions. In this intertwining world there is no set hierarchy; rather, the Queen’s job is to be an ambassador of her magical land rather than a ruler. She speaks to the trees and listens to their wisdom as she makes her rounds. The tree is a universal and archetypal symbol that can be found in spiritual practices and traditions all over the world. With roots that dig back into the depths of time and the Otherworld and branches that stretch upwards towards what is yet to come, trees were often metaphors or models for the universe itself. In Siberia, nomadic shepherds believed they existed on the trunk of a giant sacred tree, whose uppermost branch touched the North Star. Every year on the winter solstice, a group of shamans and elders would take a spiritual journey to the top (aided by psychedelic amanita mushrooms) to gain wisdom that would help their people in the coming year. In ancient Ireland, each clan had their own sacred tree where important ceremonies were conducted. The tree was seen as incredibly powerful and the success of the royalty inaugurated under it rested on its wisdom and health. Native North Americans revered cottonwood as a connection to the afterlife, using its scented boughs in funerary rites. Examples of sacred uses of trees go on and on, in practically every culture around the world… as do stories of magical spirits that inhabit trees: there’s the Yakshis of India, the Dryads of Greece, the Kodama of Japan, the Lauma of the Baltic regions, the Pi-Fang of China, and so on. Trees were sometimes even treated as sacred beings themselves, with offerings made to them in the form of ale, bread, or other riches. It’s no wonder that the magic of trees was revered by such a wide variety of cultures; just standing below a giant tree and considering the hundreds of rings that surround its girth inspires images of the swirling, changing landscape its long lifespan allowed it to observe. Trees represent growth, spiritual and physical nourishment, gentle transformation, and fertility. Oaks also represent doorways (their Sanskrit root “duir” also gave rise to the word “door”.) Ancient peoples thought that one could access the Otherworld by crawling through their roots; another interpretation was the opportunity for greater wisdom or access to a spiritual realm that oaks provided. I can certainly imagine the Queen of the Forest calling upon the wisdom of oak trees to guide her in her earthly work. The fruit of the oak tree, acorns, are a universal symbol for potential. No doubt this is because they carry the potential to become some of the tallest trees in the forest, all packed into a tiny hand-held nut. It’s a visceral representation of a seemingly-miraculous feat. Acorns also represent fertility and bounty. A single oak tree goes through a cycle of production; since too many acorns were eaten by growing animal populations each year, oak trees gradually evolved to only produce a large bounty every several years. This kept the population of the animals that relied on them down enough that there would be plenty leftover to sprout after their feasting. And when you find an oak tree in one of its bountiful years, the results can be staggering: piles upon piles of little shiny nuts accumulate below, where they are collected by all manner of critters preparing for winter. We, too, can eat acorns - as long as we process them right. It seems that most of humanity has forgotten about this rich foodstuff that we sweep into gutters, probably because, unlike many other nuts, you can’t just eat an acorn raw. Oaks and acorns are high in tannins, which are a bitter substance that humans have a hard time digesting. We consume small amounts of tannins in some of our favorite foods such as wine, tea, and coffee, but the relatively high amounts in acorns can cause gastric distress and mild toxicity in the kidneys. The good thing about these toxins is that it’s pretty easy to tell they’re there: they have a characteristic bitterness with an astringent “puckery” effect. It’s not terribly difficult to strip these tannins out of acorns to make them edible, though it does take some work. Native Americans submerged baskets of acorns in clean, quickly-flowing mountain streams for a few weeks to leach theirs; modern equivalents can include rigging up a similar system in toilet tanks! The best technique I’ve tried so far is John Kallas’ method of grinding the fresh acorns into meal, then drying that and grinding it into powder, and THEN leaching it by spreading it out on a muslin “net” suspended over a wide container and running several changes of fresh water through it until it no longer tastes at all bitter. Different kinds of acorns have different levels of tannins; in general, red oak species have more tannins than white oaks so it’s best to process them separately. (Though don’t write off red oaks - while they may take more work, they’re also more flavorful!) So why bother with all of this leaching? Well, because acorns taste AMAZING. The first time I smelled the intoxicating scent of acorns roasting in my oven, I fell in love. It’s warm and caramel-like with hints of maple and cozy evenings by the fire. It’s no exaggeration to say that I swooned over them as they cooked. After leaching, acorns retain a shocking amount of flavor that can be put to use in all manner of baked goods from muffins to pancakes. They also contain pretty high levels of starch, making them useful in thickening soups or puddings, such as the Korean specialty of acorn jelly. Ancient cultures used to absolutely love eating acorns, probably partly because oaks grow in many climates all over the world, including throughout the Americas and across Europe and Asia. But I like to think that their infatuation with this readily-available source of food was the same as mine: their utterly bewitching flavor that tastes like coziness and comfort. And after a long day of trudging through chilly autumn forests checking in on her arboreal subjects, nothing warms up an elfin queen quite the way acorn cake does. This stunning cake is fit for any royalty: a soft, gluten-free bundt cake baked with acorn flour is slathered in a maple-bourbon icing, then decorated with a shimmering crown of candied acorns and hazelnuts. The presentation is stunning, but the toasty smell wafting from the cake itself is even more bewitching. The final touch on this Queenly feast is a dollop of silky and warm maple-scented acorn pudding to saturate the cake with its creaminess. Oh, how divine. As you eat this cake, think of the reverence and wisdom contained in each little acorn. Think of the hard work and time you spent processing the acorns into edible flour. Think of the relationships the forest is built on. And finally, think of your own inherent natural wisdom that becomes unlocked when you pause in a chilly rain-soaked forest and just listen to the trees. You, too, can be an Elfin Queen. This is your golden crown. This bundt cake is decadent and full of delicious flavor from the magical woods. Acorns lend the most intoxicating rich caramel-like flavor, and maple syrup highlights it even more. If you really want to go “nuts” on the tree theme, add 1/2 cup chopped walnuts or black walnuts to your cake batter. You’ll have the rapt attention of all the squirrels in the neighborhood. Candying nuts is not as hard as it looks, and takes only a couple of ingredients! These can be made a couple of days in advance and stored in a sealed container. Since the caramel will go from liquid to solid pretty quickly, you’ll need to have everything in place ahead of time. Skewer the side of the nuts or acorns with long toothpicks or bamboo skewers and place them on a plate by the stove. The toothpicks just need to go in a fraction of an inch - push them in too far and the nut will crack. Get a few heavy books out and set them on the counter. Below the books, on the floor, place a big sheet of aluminum foil. To get the spikes on the nuts, you’ll sandwich the ends of the skewers under the heavy books and let them drip onto the floor. They’ll harden as they drip, forming spikes! Make sure you rotate the toothpick so the “top” of the nut points toward the floor. Put the water, sugar, and salt into a small pot. You want to use the smallest pot you have that will hold the water and sugar so that you have more depth for dipping. Put it on medium heat and let it simmer. Don’t bother with stirring - it’ll mix itself up when it simmers. Keep an eye on it - this will go from caramel to burned really quickly. Let it simmer away until it begins to take on a caramel color. Every now and then, shake or swirl the pan to mix and get a better idea of the color. When the mixture is an amber color, remove it from the heat and place it on a pot holder. Liquid caramel is incredibly hot, so use caution when dipping and never touch it with your fingers! It’s tempting to touch it since it’s shiny and smooth, but be careful not to give in to that temptation. To dip your nuts, just submerge one at a time, holding onto the skewer, and swirl around until covered. Then use the book to hold the end of the skewer over the lined floor to make your caramel “icicles.” Let harden completely. You’ll need to work pretty fast, since the caramel will harden quickly. You’ll get a feel for dipping the nuts quickly. Once cooled, store the caramel-dipped nuts in an airtight container until ready to serve. Caramel is sensitive to humidity so it may become sticky if left out for too long. While processing acorns takes some time and effort, the actual baking of this cake is quite simple. I made mine gluten-free by using a cup-for-cup baking mix, but you can use normal cake flour instead if you’re not on a restricted diet. A hint of maple extract further accentuates the warm acorn flavor. Preheat oven to 350F. Lightly grease a 9 or 10 cup bundt pan. In a medium bowl, sift the flours, baking powder, baking soda, and salt. In a separate bowl, beat together the butter and brown sugar until light and fluffy, then add the eggs one at a time, beating for a minute or two in between. Mix in the maple syrup. Add half the flour mixture to the egg mixture and beat. Then add the sour cream or yogurt and vanilla and beat. Add the rest of the flour mixture and mix until just combined. Scrape the sides and bottom of the bowl after each addition. Scoop the batter into the prepared pan and bake for 45 to 50 minutes, until a toothpick comes out clean. Let the cake cool for 10 minutes in the pan, then turn it out onto a serving plate. This glaze is as cozy and warm as an evening by a wood stove. It’s delicious over the acorn cake above, but would also be fantastic on top of gingerbread or molasses cookies! Combine the butter, maple syrup, and bourbon in a medium saucepan. Bring to a rapid boil, then reduce to a simmer and cook for 5-8 minutes, until it thickens to a syrupy consistency. Pour the glaze over the cake and place the candied nuts in place. Allow to cool completely before serving. This is adapted from a recipe by John Kallas, of Wild Food Adventures. He leads wonderfully educational workshops in Portland. You can learn more about his programs here! The natural starches in cold-leached acorn flour are what thickens this delicious pudding, so don’t substitute any other kind of flour or nut instead. This pudding is wonderful on its own, but is extra tasty when drizzled over acorn cake. Whisk all ingredients together in a skillet over medium heat. Stir constantly until pudding has thickened, then remove from heat. Serve warm drizzled over slices of cake. A note on substitutions: I know not everyone is able to or will want to go through the labor-intensive process of leaching acorns and grinding them into flour. They really are the heart of this cake, but you *can* substitute around them. Try using hazelnut or almond flour in the bundt cake (and doubling the maple extract) and candying hazelnuts instead of acorns. The acorn pudding can not be substituted as it’s the starches in acorns that allow them to thicken into a pudding, but you could serve your cake with a simple vanilla pudding or cream sauce instead. P.S. 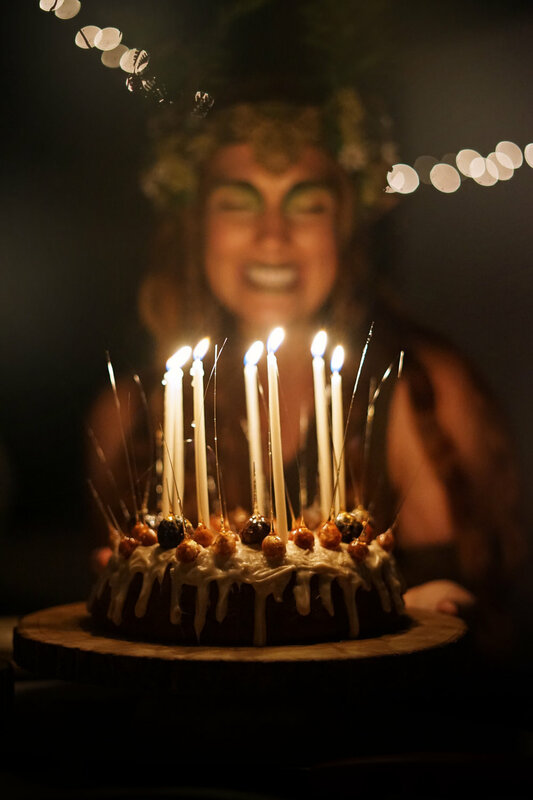 The smiling face featured in some of these photos belongs to my magical friend Chelsea, who threw a wonderful elfin party this summer!